This weekend, top-tier teams like Duke, Baylor, Xavier and Butler are looking to bounce back from disappointing losses. The key word for this weekend is bounceback. That's what teams like Duke, Baylor, Michigan State, Minnesota, Vanderbilt, Xavier and Butler will be looking to do following disappointing losses over the past week. The really good teams in college basketball understand the importance of putting past results, good or bad, behind them as quickly as possible. We'll see this weekend who is stuck in the past, and who is ready to move forward. These are not easy times for Duke, which got manhandled at Florida State in its first game without senior forward Amile Jefferson (foot). Assuming Jefferson does not play in this one, it’s a lot to ask for the Blue Devils to knock off a surging Cardinals team on the road. Louisville leads the nation in defensive efficiency, and you know the Cardinals will be dialed in for this one. The Seminoles are in the midst of a historic gauntlet, which has them playing six consecutive games against ranked teams. The thing is, four of those games are at home, and I think they are gaining confidence, not getting fatigued, during this stretch. I’ve been pumping this team for weeks, and I’m not gonna bail now. Notre Dame had another close shave on Thursday night but managed to escape Coral Gables with a five-point win over Miami. Once again, free throws were the story, with the nation’s best free throw shooting team sinking 12 out of 14 attempts. That pushed the Irish to 4–0 in the ACC, but in the meantime Virginia Tech has lost two of its last three and played its last game on Tuesday night at home. When the Hokies were blown out at Florida State, they did not have senior guard Seth Allen, who was out with a concussion. With Allen in the lineup, with the extra two days of rest, with the game in Blacksburg, it’s not hard to envision the Irish sustaining their first league loss. Both these teams are coming off tough road losses. Butler fell at Creighton after falling behind by 20 at halftime. Xavier also got blitzed by 25 points at Villanova in a game where its three starting guards shot a combined 9 for 35 from the floor. So we shouldn’t expect a pretty game, but Butler has been scoring a little more easily this season than Xavier has, and the Bulldogs should benefit from home court advantage. Baylor’s reign as the nation’s No. 1 team didn’t last very long as the Bears committed 29 turnovers and got blitzed at West Virginia on Tuesday night. Kansas State, meanwhile, has lost three games by a combined five points, including Tuesday’s 66–65 decision at Texas Tech. Both these teams play a slow tempo, so it will be a comfortable matchup. 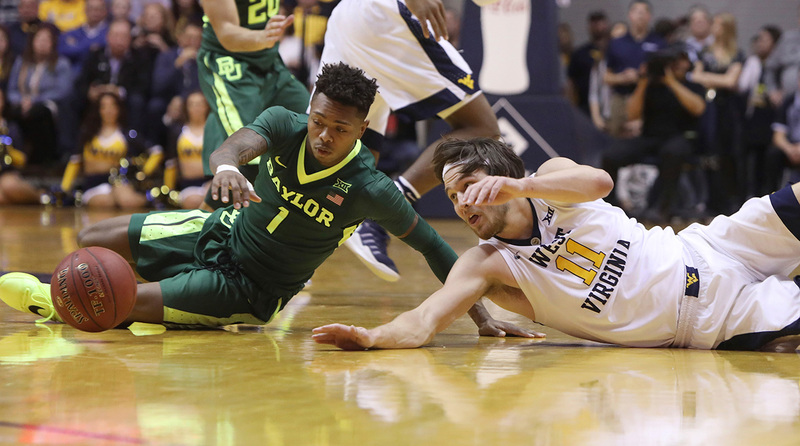 Baylor just has more talent, and the Bears will be very much looking to bounce back from the debacle in Morgantown. UCLA is a late Dillon Brooks three-pointer from being perfect, but this is going to be a difficult test. Not only are the Utes playing some pretty good basketball (they easily dispatched USC by 22 points Thursday night), but this is also the second game in three days for UCLA in high altitude. I spy an upset. Get ready for a Gonzaga boomlet. If the Bulldogs are able to win this one, then a lot more people will start to realize that they could enter the NCAA tournament undefeated. The Zags’ defense will really be tested in this one, especially with regards to Gaels forward Jock Landale, who is averaging 17.8 points per game on 64.2% shooting. But most people probably don’t realize that Gonzaga’s defense (No. 8 in the country in efficiency) is actually better this season than its offense (No. 14). This is the biggest game of the year for Gonzaga, and it’s taking place at home. I expect the Zags to bring their A game. It’s a modern edition of a classic Big East rivalry, but this matchup won’t exactly call to mind the glory days. Georgetown finally got off the Big East schneid with a 28-point win at home over St. John’s Monday night, while UConn also broke a four-game losing streak with home wins over UCF and Temple. I normally like to go with a desperate home team, but the Verizon Center is not a great home court environment, and I do think the Huskies, who were bolstered by a career-high 23 points from Kentan Facey in the win over Temple, might be starting to hit their stride. The Golden Gophers came crashing back to earth pretty hard on Wednesday night when they were throttled by 18 points at Michigan State. Perhaps that’s to be expected during a difficult stretch where they are playing four out of five games on the road. The Nittany Lions did not have a midweek game, which means they have had plenty of time to pivot from their upset win over the Spartans in the Palestra last weekend. But while Minnesota is young, it is also a tough defensive team (11th nationally in defensive efficiency) that should arrive in Happy Valley in a most unhappy mood. It has been a rough season for Vanderbilt, but the Commodores almost pulled off an epic upset Tuesday night before falling at home to Kentucky by six. The Commodores are the best three-point shooting team in the conference, but they only shot 27.6% from behind the arc and still had a chance to win. That tells me this team is maturing, and there’s no better way to prove that than to bounce back with a win at home over your intra-state rival.